In what has become a a bit of a running theme, our plans were radically changed after we awoke to terrential rain. No Statue of Liberty but this is New York so there were plenty of other indoor options. First stop was the United Nations (excellent bookstore and some really good photography exhibits) and then after lunch onto the New York Public Library. The library, a very grand marble buidling with ornate fixtures and highly decorative plaster ceilings, is home to some of the oldest and most significant collections in the world. Many are special collections which can only be accessed by those trained to handle such delicate documents and where a good reason to do so has been supplied and approved. 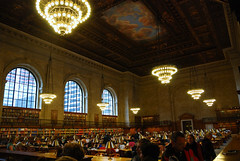 The reading room seen here is the only area where members of the public can freely access books, use the internet or whittle away the afternoon browsing the shelves. This picture only shows the southern reading room, the northern is as big and there is a centre one as well. We ended the day with dinner in Soho and a walk through Little Italy and China town. Little Italy is great, lots of pasta and pizza places, good coffee and big desserts. Chinatown is lined with vendors flogging imitation Dolce and Gabana handbags, sunglasses and brand name perfumes. I refrained, there is something about wonky glasses and vinyl bags that doesn’t quite cut it, maybe in Italy.